The Wheel of Life describes the cause of all evil and its effects, mirrored in earthly phenomena just as it is experienced by everyone from the cradle to the grave. Picture by picture it reminds us that everyone is always his or her own judge and responsible for their own fate, because, according to Karma, causes and their effects are the fruits of one's own deeds. 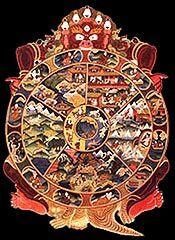 The circular composition of the Wheel of Life guides the viewer from picture to picture along the black path or the white path. It leads one through the twelve interwoven causes and their consequences to rebirth in one of the so-called Six Worlds. Projected on one plane, they fill the whole inner sphere the Wheel of Life. But the meaning of this painting is to show the way out of all these worlds of suffering into the sphere beyond.